Bintan Resorts rolls out a series of initiatives in collaboration with CrescentRating and Halaltrip, to increase its appeal to Muslim travellers across the world with a focus on the neighbouring ASEAN region, China and the Middle East. The news will further boost Indonesia which recently climbed one position to take the third spot as the top performing destination in the Mastercard-CrescentRating Global Muslim Travel Index (GMTI) 2017. The new initiative includes the Muslim Visitor Guide to Bintan Resorts that will be available in English and subsequently translated to Arabic and Chinese. The guide highlights Muslim friendly resorts, attractions and Halal friendly restaurants, providing visitors with a high level of assurance. A dedicated microsite on HalalTrip has also been developed to showcase and highlight the Muslim-friendly options in Bintan Island. All establishments have been rated based on CrescentRating’s rating system for Muslim friendliness. Services rated include Hotels, Restaurants, Spas, Attractions, and more. 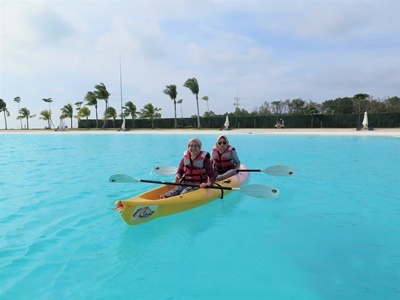 Nestled in Indonesia’s Riau Archipelago, Bintan Resorts is an integrated beach resort destination that boasts of pristine beaches, exciting water sports and championship golf courses. Its strategic proximity to Malaysia and Singapore is complimented by the island’s rich culture and heritage attractions such as Pulau Penyengat, home to the majestic Masjid Raya Sultan Riau built in the 18th century. Being an island respite away from hectic city life positions Bintan Resorts as an attractive destination for tourists keen to explore one of the most unique places in Asia. During this Ramadan, there will also be events held at Lagoi Bay Bintan. The MasterCard-CrescentRating Global Muslim Travel Index (GMTI) 2017, the most comprehensive research that has been released on the sector, revealed that the Muslim travel market will continue to grow at a fast pace with the sector estimated to grow to US$220 billion in 2020 and US$300 billion by 2026. To download a copy of the visitor guide please visit www.halaltrip.com/downloadable-halal-travel-guides To visit the dedicated Bintan micro site please visit here.